This book comes out next Tuesday! As a busy mom and pedigree Poodle owner, Melanie has little time to spare. Still, she doesn’t mind helping out at Puppy Fest, an annual fundraiser to benefit Puppy Posse, a local dog rescue organization. Considering the venue—Belle Haven mansion, owned by wealthy philanthropist Leo Brody—it’s shaping up to be the can’t-miss charity event of the summer. Unfortunately, when Melanie’s breeding background lands her in the doghouse with Jane, Leo’s snappy daughter who runs the rescue, Melanie finds herself simultaneously managing Puppy Fest and the millionaire’s hopelessly fractious family. 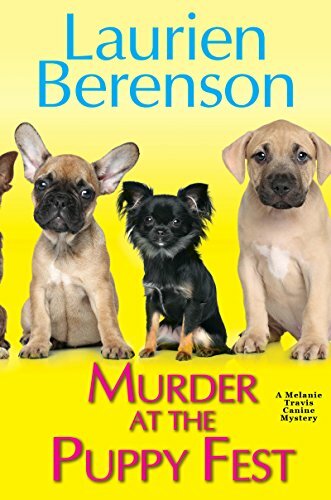 A Puppy Fest sounds like a great fundraiser and a lot of fun, until the the millionaire hosting the gala is found dead and Melanie is the one that finds him with his mistress right next to his body. He appears to have had a severe allergic reaction to nuts in some cookies. (Same allergy I have.) The man, Leo Brody not only had millions, he had 3 ex-wives and 9 children and several grandchildren too. All of who will be inheriting his millions. One of his offspring believes his death was no accident and she wants Melanie to find out who did him in. A subplot involving a dog rescue also brings a new four legged friend to Melanie’s house too. I get a huge smile on my face when I start reading these stories. Melanie, husband Sam, sons Davey and Kevin, along with their Standard Poodles, Faith, Tar, Augie, Eve and Raven, make a pretty full household but they seem to have everything down to a science. Melanie and Sam are very organized because they have to be. They are pretty easy going and most of the time the boys a very well behaved. Melanie’s Aunt Peg stops by almost daily. She is a little pushy for my tastes but her heart is in the right place. In this installment, Melanie has been recruited to help wrangle puppies as they get ready for the puppy bowl, part of the Puppy Fest raising money for a local dog rescue. She doesn’t get off on the right foot with the rescue owner and is set on various errands were she meets most of the Brody family. They are quite a bunch. When their father/grandfather ends up dead she is forced to meet with each of them again. Yes, they are all suspects but she finds herself stumped as to who actually would have killed the man. The author has created very unique characters. Their tumultuous upbringing has effecting each of them in a different way. The story moves right along because Melanie and her family have a very busy life with work, soccer camp, dog shows and preparation, and general family things. Add trying to solve whether Joe Brody death was accidental or murder isn’t really her first concern, especially when she really has no skin in the game. She is not a suspect and no one she loves is a suspect, but she does love to try to solve this mysteries. But her investigation can put her and the people she loves in danger. Again Laurien Berenson’s characters and their situations keep us engaged from the very first page. The subplot I mentioned above starts the whole story and while I really enjoyed the mystery, this was my favorite part of the book. Davey wrapped himself right around my heart and when the story ended I wanted to reach right into the pages and give him a huge hug. sounds like a fun read! Thank-you for the opportunity. Who doesn’t love puppies! I would enjoy reading any book about puppies, and this one sounds like a winner! I love Ms. Berenson. Her books are entertaining and like chips, you can not eat just one. The covers of Laurien Berenson’s books are so inviting and this latest one is no exception. Thank you for including Ms. Berenson and her latest book on your blog. Also for the opportunity to enter this giveaway.